Don't forget this amazing opportunity is just WAITING for you to take advantage of it! FaveCrafts is spoiling all of you lucky viewers out there with a chance to win a free eBrush. No gimmicks, no 'over-the-top' requirements, no commitments. Simply follow the information below to the FaveCrafts website (link is provided) and fill out a form. It is just the way Craftwell likes it: Easy to do! 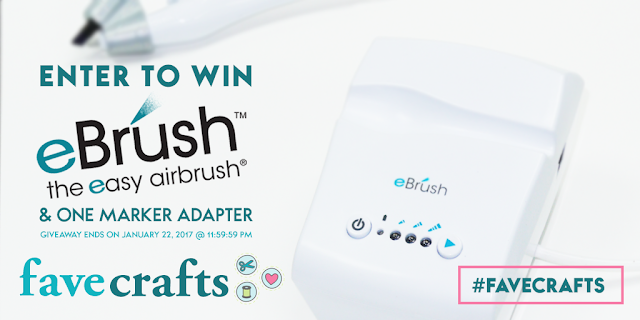 Enter for your chance to win 1 eBrush and adaptor. The deadline to enter is January 22, 2017 at 11:59:59 p.m. If you love the artsy, whimsical look of an airbrush effect, the eBrush is about to change everything for you! Any marker becomes an airbrush when you attach it to the eBrush. Visit FaveCrafts on Facebook or Twitter to keep updated on the newest giveaways!